Description: Yarrow is herbaceous, perennial plant, grows up to 1 meter in height. It has one to several fibrous and rough stems, and leaves evenly distributed along the stem. Leaves are larger near the base, bipinnate to tripinnate slightly hairy and silky. Flowers are arranged into flat-topped clusters, with numerous, small and white flower heads. Flowering occurs from May to August. Parts used: Stem, leaves, flowers. Useful components: Achilleine, camphor, eugenol, proazulene, sterols, sesquiterpene lactones, tannins, triterpenes. 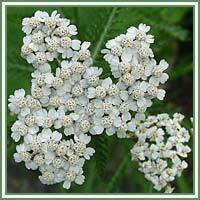 Medicinal use: Yarrow is considered to be antipyretic, diaphoretic, astringent, anti-inflammatory, antispasmodic, carminative, cholagogue, hemostatic and sedative. It has been shown useful in cases of fevers and colds (usually in form of a tincture or infusion). In form of a tea, it is helpful in cases of stomach ulcers, amenorrhea, abdominal cramps, abscesses and diarrhea caused by bacterial infections. It relieves menstrual pains and cramps, and has a sedative effect, and acts as anti-inflammatory in cases of cystitis and urethritis. External use (ointments, salves, powders) is beneficial in treatments of hemorrhoids, nosebleed, wounds and bruises. 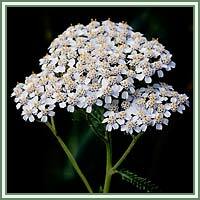 Safety: In some cases Yarrow could cause severe allergic reactions. Prolonged use could increase photosensitivity of the skin. Some herbs could react with certain medication. Therefore, it is advisable to consult your doctor before consumption of any herb.